I have at least one project where I don't seem to be able to add a Web module, while in others I can, and/or already have. In at least that one project, right clicking on a module and hovering over the Add item shows only New Module and Import Module, and the facets panel shows "Nothing here" when you click Add. 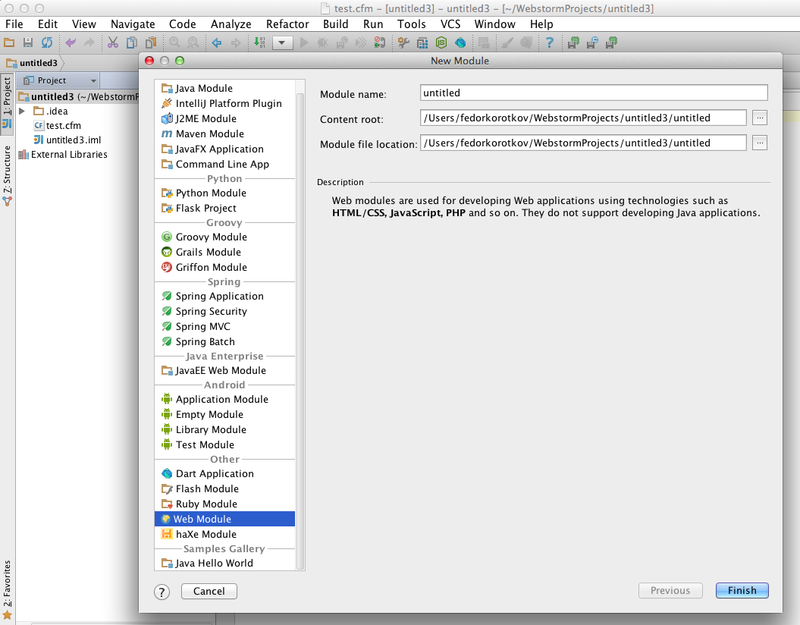 At least one other project shows the above, but also shows a divider, then EJB, JPA, JavaEE Application, and Web. The Facets panel also lets me add those same items, and that project already has a Web module. Both projects are primarily ColdFusion, if that matters. I only need Web to specify paths to non-CFML assets, so completion and path validation work. JavaEEIntegration is enabled. I'm using IU-129.111. What am I missing here? What is it about a project that doesn't allow that functionality? Could you please provide a screencast? You can capture one with http://www.screenr.com/ it doesn't require any additional installation. I can add a Web Module to a Web Module with coldfusion files. It's also confusing (to me) that you can only map web resource directories in a JavaEE Application module, not a plain Web module. I'd think the need to mirror web server mappings could exist for any web app, not just J2EE ones.